Neural stem cells have been identified in nearly all regions of the developing mouse, rat and human central nervous system (CNS) and in specialized neurogenic regions of the mature CNS.The identification of CNS-resident NSCs and the discovery that adult somatic cells from mouse and human can be reprogrammed to a pluripotent state, and then directed to differentiate into neural cell types, has opened the door to new therapeutic avenues aimed at replacing lost or damaged CNS cells. 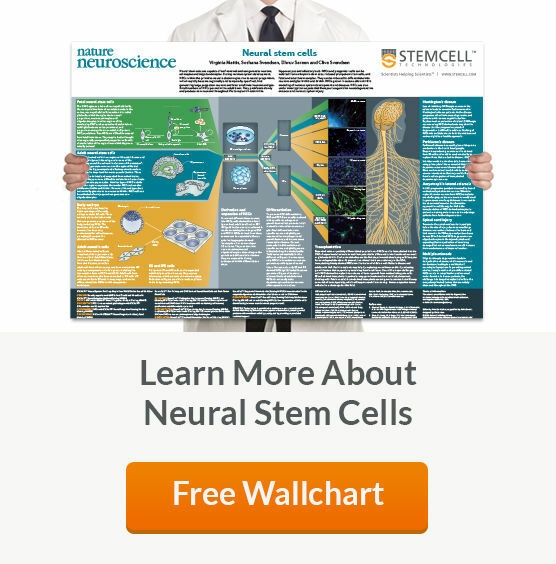 We've created these resources to support your neural stem cell research. This webinar provides an overview of the neurosphere and adherent monolayer methods to culture neural stem and progenitor cells. Technical aspects and details associated with performing each of the culture methods are discussed. In addition, data comparing the two methods is presented. The mature mammalian central nervous system (CNS) is composed of three major differentiated cell types: neurons, astrocytes and oligodendrocytes. Neurons transmit information through action potentials and neurotransmitters to other neurons, muscle cells or gland cells. Astrocytes and oligodendrocytes, collectively called glial cells, play important roles of their own, in addition to providing a critical support role for optimal neuronal functioning and survival. During mammalian embryogenesis, CNS development begins with the induction of the neuroectoderm, which forms the neural plate and then folds to give rise to the neural tube. Within these neural structures there exists a complex and heterogeneous population of neuroepithelial progenitor cells (NEPs), the earliest neural stem cell type to form.1,2 As CNS development proceeds, NEPs give rise to temporally and spatially distinct neural stem/progenitor populations. During the early stage of neural development, NEPs undergo symmetric divisions to expand neural stem cell (NSC) pools. In the later stage of neural development, NSCs switch to asymmetric division cycles and give rise to lineage-restricted progenitors. Intermediate neuronal progenitor cells are formed first, and these subsequently differentiate to generate to neurons. Following this neurogenic phase, NSCs undergo asymmetric divisions to produce glial-restricted progenitors, which generate astrocytes and oligodendrocytes. The later stage of CNS development involves a period of axonal pruning and neuronal apoptosis, which fine tunes the circuitry of the CNS. A previously long-held dogma maintained that neurogenesis in the adult mammalian CNS was complete, rendering it incapable of mitotic divisions to generate new neurons, and therefore lacking in the ability to repair damaged tissue caused by diseases (e.g. Parkinson’s disease, multiple sclerosis) or injuries (e.g. spinal cord and brain ischemic injuries). However, there is now strong evidence that multipotent NSCs do exist, albeit only in specialized microenvironments, in the mature mammalian CNS. This discovery has fuelled a new era of research into understanding the tremendous potential that these cells hold for treatment of CNS diseases and injuries. Neural Stem Cell (NSCs): Multipotent cells which are able to self-renew and proliferate without limit, to produce progeny cells which terminally differentiate into neurons, astrocytes and oligodendrocytes. The non-stem cell progeny of NSCs are referred to as neural progenitor cells. Neural Progenitor Cell: Neural progenitor cells have the capacity to proliferate and differentiate into more than one cell type. Neural progenitor cells can therefore be unipotent, bipotent or multipotent. A distinguishing feature of a neural progenitor cell is that, unlike a stem cell, it has a limited proliferative ability and does not exhibit self-renewal. Neural Precursor Cells (NPCs): As used here, this refers to a mixed population of cells consisting of all undifferentiated progeny of neural stem cells, therefore including both neural progenitor cells and neural stem cells. The term neural precursor cells is commonly used to collectively describe the mixed population of NSCs and neural progenitor cells derived from embryonic stem cells and induced pluripotent stem cells. During mammalian CNS development, neural precursor cells arising from the neural tube produce pools of multipotent and more restricted neural progenitor cells, which then proliferate, migrate and further differentiate into neurons and glial cells. During embryogenesis, neural precursor cells are derived from the neuroectoderm and can first be detected during neural plate and neural tube formation. As the embryo develops, neural stem cells can be identified in nearly all regions of the embryonic mouse, rat and human CNS, including the septum, cortex, thalamus, ventral mesencephalon and spinal cord. NSCs isolated from these regions have a distinct spatial identity and differentiation potential. In contrast to the developing nervous system, where NSCs are fairly ubiquitous, cells with “neural stem cell” characteristics are localized primarily to two key regions of the mature CNS: the subventricular zone (SVZ), lining the lateral ventricles of the forebrain, and the subgranular layer of the dentate gyrus of the hippocampal formation (described later).11 In the adult mouse brain, the SVZ contains a heterogeneous population of proliferating cells. However, it is believed that the type B cells (activated GFAP+/PAX6+ astrocytes or astrogliallike NSCs) are the cells that exhibit stem cell properties, and these cells may be derived directly from radial glial cells, the predominant neural precursor population in the early developing brain. NPCs in this niche are relatively quiescent under normal physiological conditions, but can be induced to proliferate and to repopulate the SVZ following irradiation.10 SVZ NSCs maintain neurogenesis throughout adult life through the production of fast-dividing transit amplifying progenitors (TAPs or C cells), which then differentiate and give rise to neuroblasts. TAPs and neuroblasts migrate through the rostral migratory stream (RMS) and further differentiate into new interneurons in the olfactory bulb. This ongoing neurogenesis, which is supported by the NSCs in the SVZ, is essential for maintenance of the olfactory system, providing a source of new neurons for the olfactory bulb of rodents and the association cortex of non-human primates.12 Although the RMS in the adult human brain has been elusive, a similar migration of neuroblasts through the RMS has also been observed.13 Neurogenesis also persists in the subgranular zone of the hippocampus, a region important for learning and memory, where it leads to the production of new granule cells. Lineage tracing studies have mapped the neural progenitor cells to the dorsal region of the hippocampus, in a collapsed ventricle within the dentate gyrus.10 Studies have demonstrated that neurogenic cells from the subgranular layer may have a more limited proliferative potential than the SVZ NSCs and are more likely to be progenitor cells than true stem cells.14 Recent evidence also suggests that neurogenesis plays a different role in the hippocampus than in the olfactory bulb. Whereas the SVZ NSCs play a maintenance role, it is thought that hippocampal neurogenesis serves to increase the number of new neurons and contributes to hippocampal growth throughout adult life.12 Neural progenitor cells have also been identified in the spinal cord central canal ventricular zone and pial boundary15-16, and it is possible that additional regional progenitor populations will be identified in the future. In vitro methodologies designed to isolate, expand and functionally characterize NSC populations have revolutionized our understanding of neural stem cell biology, and increased our knowledge of the genetic and epigenetic regulation of NSCs.17 Over the past several decades, a number of culture systems have been developed that attempt to recapitulate the distinct in vivo developmental stages of the nervous system, enabling the isolation and expansion of different NPC populations at different stages of development. Here, we outline the commonly used culture systems for generating NPCs from pluripotent stem cells (PSCs), and for isolating and expanding NSCs from the early embryonic, postnatal and adult CNS. Neurosphere culture: The neurosphere culture system has been widely used since its development as a method to identify NSCs.26-29 A specific region of the CNS is microdissected, mechanically or enzymatically dissociated, and plated in a defined serum-free medium in the presence of a mitogenic factor, such as epidermal growth factor (EGF) and/or basic fibroblast growth factor (bFGF). In the neurosphere culture system, NSCs, as well as neural progenitor cells, begin to proliferate in response to these mitogens, forming small clusters of cells after 2 - 3 days. The clusters continue to grow in size, and by day 3 - 5, the majority of clusters detach from the culture surface and begin to grow in suspension. By approximately day seven, depending on the cell source, the cell clusters, called neurospheres, typically measure 100 - 200 μm in diameter and are composed of approximately 10,000 - 100,000 cells. At this point, the neurospheres should be passaged to prevent the cell clusters from growing too large, which can lead to necrosis as a result of a lack of oxygen and nutrient exchange at the neurosphere center. To passage the cultures, neurospheres are individually, or as a population, mechanically or enzymatically dissociated into a single cell suspension and replated under the same conditions as the primary culture. NSCs and neural progenitor cells again begin to proliferate to form new cell clusters that are ready to be passaged approximately 5 - 7 days later. By repeating the above procedures for multiple passages, NSCs present in the culture will self-renew and produce a large number of progeny, resulting in a relatively consistent increase in total cell number over time. Neurospheres derived from embryonic mouse CNS tissue treated in this manner can be passaged for up to 10 weeks with no loss in their proliferative ability, resulting in a greater than 100- fold increase in total cell number. NSCs and neural progenitors can be induced to differentiate by removing the mitogens and plating either intact neurospheres or dissociated cells on an adhesive substrate, in the presence of a low serum-containing medium. After several days, virtually all of the NSCs and progeny will differentiate into the three main neural cell types found in the CNS: neurons, astrocytes and oligodendrocytes. While the culture medium, growth factor requirements and culture protocols may vary, the neurosphere culture system has been successfully used to isolate NSCs and progenitors from different regions of the embryonic and adult CNS of many species including mouse, rat and human. Adherent monolayer culture: Alternatively, cells obtained from CNS tissues can be cultured as adherent cultures in a defined, serum-free medium supplemented with EGF and/or bFGF, in the presence of a substrate such as poly-L-ornithine, laminin, or fibronectin. When plated under these conditions, the neural stem and progenitor cells will attach to the substrate-coated cultureware, as opposed to each other, forming an adherent monolayer of cells, instead of neurospheres. The reported success of expanding NSCs in long-term adherent monolayer cultures is variable and may be due to differences in the substrates, serum-free media and growth factors used.17 Recently, protocols that have incorporated laminin as the substrate, along with an appropriate serum-free culture medium containing both EGF and bFGF have been able to support long-term cultures of neural precursors from mouse and human CNS tissues.30-32 These adherent cells proliferate and become confluent over the course of 5 - 10 days. To passage the cultures, cells are detached from the surface by enzymatic treatment and replated under the same conditions as the primary culture. It has been reported that NSCs cultured under adherent monolayer conditions undergo symmetric divisions in long-term culture.30,33 Similar to the neurosphere culture system, adherently cultured cells can be passaged multiple times and induced to differentiate into neurons, astrocytes and oligodendrocytes upon mitogen removal and exposure to a low serum-containing medium. Research in the field of NSC biology has made a significant leap forward over the past ~30 years. Contrary to the beliefs of the past century, the adult mammalian brain retains a small number of true NSCs located in specific CNS regions. The identification of CNS-resident NSCs and the discovery that adult somatic cells from mouse and human can be reprogrammed to a pluripotent state,62-68 and then directed to differentiate into neural cell types, has opened the door to new therapeutic avenues aimed at replacing lost or damaged CNS cells. This may include transplantation of neural progenitors derived from fetal or adult CNS tissue, or pluripotent stem cells. Recent research has shown that adult somatic cells can be directly reprogrammed to specific cell fates, such as neurons, using appropriate transcriptional factors, bypassing the need for an induced pluripotent stem cell intermediate.69 Astroglia from the early postnatal cerebra cortex can be reprogrammed in vitro to neurons capable of action potential firing, by the forced expression of a single transcription factor, such as Pax6 or the pro-neural transcription factor neurogenin-2 (Neurog2).70 To develop cell therapies to treat CNS injuries and diseases, a greater understanding of the cellular and molecular properties of neural stem and progenitor cells is required. To facilitate this important research, STEMCELL Technologies has developed NeuroCult™ proliferation and differentiation kits for human, mouse and rat, including xenofree NeuroCult™-XF. 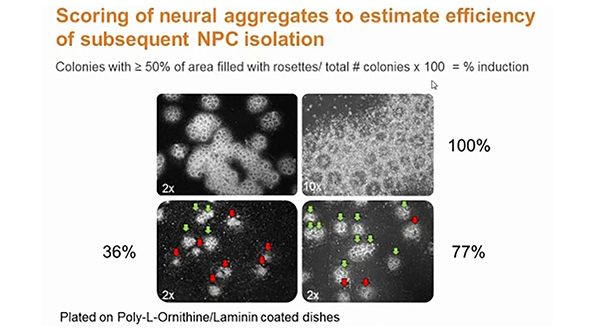 The NeuroCult™ NCFC Assay provides a simple and more accurate assay to enumerate NSCs compared to the neurosphere assay. These tools for NSC research are complemented by the NeuroCult™ SM Neuronal Culture Kits, specialized serum-free medium formulations for culturing primary neurons. Together, these reagents help to advance neuroscience research and assist in its transition from the experimental to the therapeutic phase.